Odysseas Elitis, Nobel Prize Poet. This is our DNA and the narrative of the Aegean Archipelagos. These three elements, deeply rooted in tradition for millenia, from Ancient Greece until now, are the embryo of our economy and trade, of our evolution, and our future. The Region of South Aegean is a palette of fifty islands, of fifty cuisines, of fifty cultures. Each of them has diff erent identities, colours, fl avours, smells, and characteristics. The combination of these fifty islands give us the unique Aegean Cuisine, a cuisine with fi fty dimensions that let you decide the one that fi ts your appetite the best. The basic elements remain the same but the cultural influences transform the food of every island into a new gastronomic experience. 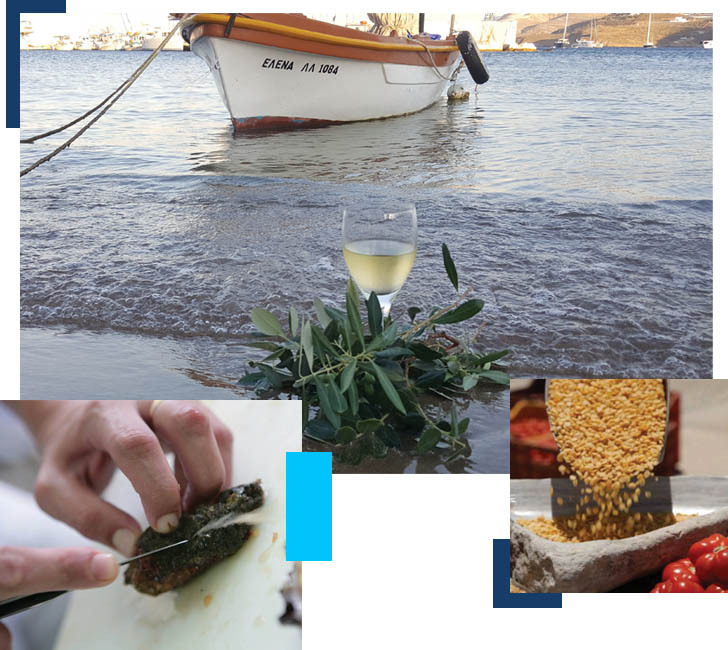 This diversity along with the variety of the terroir, the uniqueness of the ingredients, the multi traditional recipes, give the Aegean Cuisine the synonym of Gastronomy.